It’s time to dust off your lederhosen as Steam Whistle Brewing brings their own Oktoberfest celebrations to the Imperial in Vancouver on September 20th. Enjoy music from The Rheinlander Oom-pah Band, entertainment by the AVC Edelweiss Dancers from the Austria Vancouver Club in Richmond, food by Bestie, and plenty of beer. Tickets Tickets are $15 in advance online or $20 at the door. Each ticket comes with a souvenir 1/2 litre ceramic stein to cheer this renowned beer festival. Prizes will be awarded for best costumes. “Vancouver is recognized for its festivals, so we knew after our staff trip to Munich for the world famous Oktoberfest, that if we were going to share the true festival experience with our West Coast friends – we had to do it right,” explains James Foran of Steam Whistle Brewing. 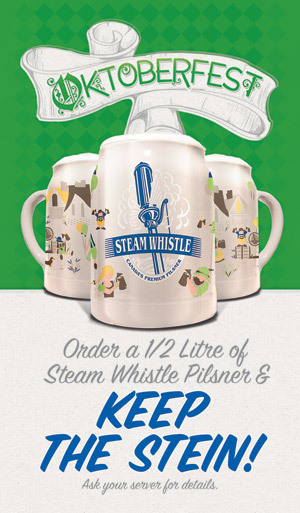 Bars across BC will also serve Steam Whistle Pilsner in the limited edition 1/2 litre Oktoberfest ceramic stein through October, while quantities last. Some will even offer a stein re-fill station, ask servers for details. Oktoberfest Facts: Each year in Munich, Germany, festival goers consume over 7 million litres of beer, 500,000 roast chickens, 240,000 sausages, 70,000 pork knuckles, and a gazillion doughy pretzels! In honour of these customary foods, Steam Whistle has Oktoberfest inspired recipes for Schnitzel and potato salad. Steam Whistle is an independent brewery housed in Toronto’s historic John St. Roundhouse, which is actually a dead ringer for the Yaletown Roundhouse in Vancouver. A 2012 Gold Medal winner at the Canadian Brewing Awards, their refreshing Pilsner is crafted with traditional European brewing methods and only four, natural (GMO-free) ingredients under the watchful eye of their Czech Brewmaster. Follow Steam Whistle on Facebook and Twitter for more information. I will draw one winner at random from all entries at 12:00pm on Thursday, September 11, 2014. Must be 19+. Please enjoy responsibly. Update The winner is Terri! DAS BOOT DAS BOOT DAS BOOT! Ich möchte etwas erleben Oktoberfest! Ich mochte eine glass bier und eine bratwurst! Wunderbar! Wissen Sie, wo ich noch einen freien Platz finde? Ich liebe Bier! Wähle mich! What a great prize!! Thank you for the opportunity:) we just had the chance to tour the Steam Whistle brewery in Toronto. Amazing Beer, would love to go!! Was für ein toller Preis !! Danke für die Gelegenheit 🙂 Wir hatten nur die Möglichkeit, die Steam Whistle Brewery in Toronto Tour. Erstaunlich Bier, würde gerne gehen !! Ich möchte mich auf meine Lederhosen setzen und trinken tief aus dem goldenen Elixier des Lebens! We usually have an Oktoberfest party every year, but this year it’s not working out. Glad to end up at this event! Ich liebe an dieser Veranstaltung teilnehmen! Das Festival klingt gut! Ich würde liebend gerne! I would love to attend this! Is it every year? I’m actually in Germany this year for Oktoberfest and planning on staying awake all day (unlike last year – http://giveforgranted.com/2014/06/how-to-last-a-whole-day-at-oktoberfest/) haha but I would love to check out other international celebrations!